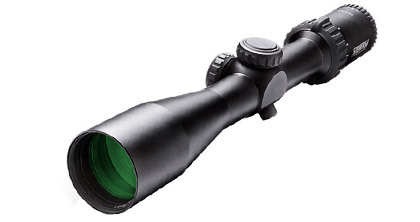 Steiner GS3 2-10x42 Plex S1 Reticle Riflescope 5004, with its broad field of view, makes it simpler to identify the target. The scope is fueled by the Steiner GS3 Rifle Scopes’ unique CAT (color adjusted transmission) lens coatings technology that distinguishes the subject from its leafy/ shadow-dappled surroundings by increasing the contrast, to help take a good shot. Features include 30mm tube, 5x zoom range, a short mounting length of 5.4 inches, aluminum housing, and waterproof and fogproof construction. In addition to that, Steiner GS3 2 10x42 for sale is fitted with the best possible optics and backed by the brand’s bedrock reliability for an exemplary performance. It is suitable for use in eastern whitetail country along with western big game ranges, and for being paired up with centerfire, rimfire, muzzleloader rifles and the like. 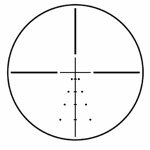 Steiner 5004 is available with Plex S1 reticle, and like the Steiner 5009 (which comes with 4A reticle), has a second focal plane. Steiner GS3 3 2 10x42 is ideal for use in eastern whitetail country along with western big game ranges. To add more, the Steiner GS3 game sensing scope from Steiner scopes for sale can easily be paired up with centerfire, rimfire, and muzzleloader rifles. Field of View: 52' - 10.5' @ 100 yd.